The Wall Street Journal's Kimberley Strassel appeared on Tucker Carlson's Fox News show Friday to discuss Thursday's Inspector General report on "Various Actions by the Federal Bureau of Investigation and Department of Justice in Advance of the 2016 Election." Strassel made the big-picture point most of the rest of the press is either ignoring or denying, namely that the IG has delivered "a searing indictment of the entire FBI and its culture." TUCKER CARLSON: Well, it’s been only a little over 24 hours since the massive DOJ Inspector General's report, over 500 pages, was released, and the public is still digesting what's in it. What are the key takeaways, and what is the press missing from all of this? Kim Strassel is on the Wall Street Journal Editorial Board. She's been following this story maybe more closely than anyone in America, and she joins us tonight. What jumped out of this report when you read it, Kim? KIMBERLEY STRASSEL: So I think one thing, Tucker, is most of the headlines today have been focussed on Jim Comey. And there's no question that this was a very damning indictment of his leadership while he was there. But then again, Democrats and a lot in the media would like to pin it all on him. What struck me was that this report was a searing indictment of the entire FBI and its culture, and in particular this argument that they tend to live by a rule that they themselves craft, that they impose rules on everyone else, but they don’t live by them. So I mean we have examples in here of  employees using their home computers and cellphones for work business. We found out that  Comey’s entire staff was complicit in helping him conceal from his Department of Justice superiors the contents of that July press conference about Hillary Clinton. We have unauthorized contacts with the press. We have an assistant attorney general, Peter Kadzik, who not only was tipping off the Clinton team about internal things while he was working on the investigation,  but then when he was made to recuse himself did not abide by the recusal. We've got Andrew McCabe leaking and then lying about it to the FBI agents who questioned him. So this is a widespread problem, at least in the leadership be across the FBI, and that was an important aspect of this report that's being missed. CARLSON: It's absolutely being missed. But you didn't miss it. Kim Strassel, thank you for that. It would be easy to argue that Strassel's point about the corrupt FBI culture isn't being "missed," but is instead being ignored, because to acknowledge its existence would vindicate points President Donald Trump has frequently made in tweets and statements — and the press simply cannot abide by that. Carlson's point that Strassel has been "following this story maybe more closely than anyone in America" is only a slight exaggeration, but there is little doubt that her perch at the Journal gives her reporting on these matters far more visibility than others who are also doing heavy lifting. Strassel's WSJ columns and tweets, especially in recent weeks, have infuriated former Obama administration members and its leftist and media defenders. To her credit, she hasn't let up. 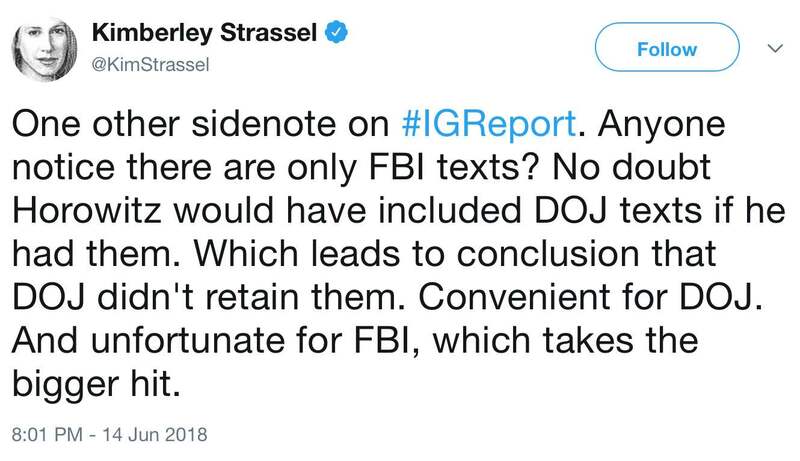 Strassel made several important points in Thursday tweets after the IG report's release. "Don't believe anyone who claims Horowitz didn't find bias." "(Horowitz only) didn't catch anyone doing anything so dumb as writing down that they took a specific step to aid a candidate." "But he in fact finds bias everywhere. The examples are shocking and concerning, and he devotes entire sections to them." "Meanwhile this same cast of characters ... seamlessly moved to the Trump investigation. And we're supposed to think they got that one right?" "(other examples of cultural corruption included) Leaks. Accepting gifts from media. Agent affairs/relationships." "Then they sit on ... (Anthony Weiner's laptop containing Hillary Clinton work-related emails for) a month, either cuz it fell through cracks (wow) or were more obsessed w/Trump." "I can still hear the echo of the howls from when Trump fired Comey. Still waiting to hear the apologies now." Don't hold your breath waiting for them, Kim.